Adults and children may find Halloween fun and exciting, but it can be scary and dangerous for the pets in our life. Here are a few tips to ensure the entire family has a happy HOWLoween. Ease Anxiety. Between ringing doorbells and noisy strangers, high energy evenings like Halloween can make dogs territorial and anxious. Plan in advance and find a relaxing place for your dog to spend the evening to keep them feeling calm and safe. Play Inside. Unfortunately, Halloween can bring out pranksters who have been known to harm pets. Keep your dogs and cats – especially black cats – indoors in the days around Halloween unless they are properly supervised. Just Say “No” to Glow. Glow sticks and glow-in-the-dark jewelry are usually nontoxic but they can still cause negative reactions. Save the glow for humans and use pet safe reflective accessories for pups instead. Mind Your Manners. 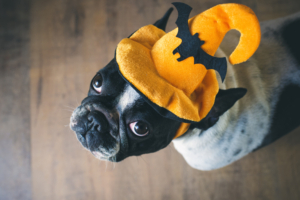 Before you take your dog trick-or-treating, make sure that she won’t be frightened by the activity, will be visible in the dark, and has good leash manners. When in doubt, leave your pooch at home. Get Dog-Minded. Amp up the Halloween festivities at events specially tailored for dogs! Pet stores, animal organizations, and websites like Sidewalk Dog have listings of celebrations taking place all month long. Click here to get more tips on Halloween pet safety. If you suspect your pet has ingested something toxic, call your veterinarian or the ASPCA Animal Poison Control Center at (888) 426-4435.